Lane’s a hard worker, he’s getting perfect scores, in the model UN and looking at a straight streak into Stanford, internships and Wall Street, that is until he gets a drug resistant form of TB which gets him sent to a boarding school for sick teens. While Lane thinks his life is over, it’s really just beginning and it teaches him something he’s never encountered before. Meanwhile troublemaker Sadie has has more than enough of Latham House and thinks that nothing will change until a past face catches up with her. I have to start this review by saying that I am in love with this novel and I’m kicking myself for not picking it up earlier. While some people have hailed it the new The Fault in Our Stars I think that’s a brush off, not only is this novel completely different but it also doesn’t do Schneider’s writing justice, this is not a rip off of John Green although I think fans of his will appreciate it. I picked this up in a book haul and completely fell in love with it from the first chapter. It’s perfectionist characters like Lane (our protagonist) that I really fall in love with because I recognise them and I understand them, being a total perfectionist myself. Extraordinary Means has a host of characters you can see walking around your head while reading. There are very few books that I get this emotionally involved in, that I pour over and finish in a matter of hours rather than days. What Schneider has managed to create is not one but four lovable characters, each with their own individual personalities that you can hold in your heart from the first page they’re mentioned to the last and I for one like to imagine after the novel and what the future holds. This kind of novel is tricky, a lot of teenagers locked up for their own good dealing with being a teenager as well as being sick. There are a lot of people who write about illnesses but TB is something we no longer considered as a threat, it’s mostly wiped out, right? In this novel it’s very real and I for one sat and thought long and hard about what it must be like living with a contagious disease, taken away from everything and having to start a new. This is the power of these types of novels they make you think not only about the plot in the novel, but also about the wider world and the people in it. Would we react as people in the novel do? Would we care about the people living without a cure? It’s definitely worth a think, especially after seeing it through Lane and Sadie’s eyes. I have to say that was one of the best parts of the novel, having two different perspectives was a nice change to a lot of YA literature. Seeing the side of a boy and a girl and their different reactions and emotions. While Lane is newer to the boarding school and a more relaxed way of life this is all Sadie has known for a long time, the differences are what makes this novel fantastic. 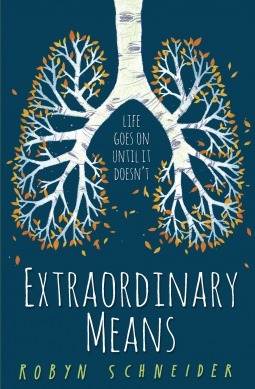 I have to give Extraordinary Means 5 stars *****. I read some Goodreads reviews that I felt were quite harsh on a novel that was superbly written. I finished this book in a matter of hours, it’s always going to have a place in my heart. Beautifully written and incredible…don’t try and compare this to any other book because you won’t find one.